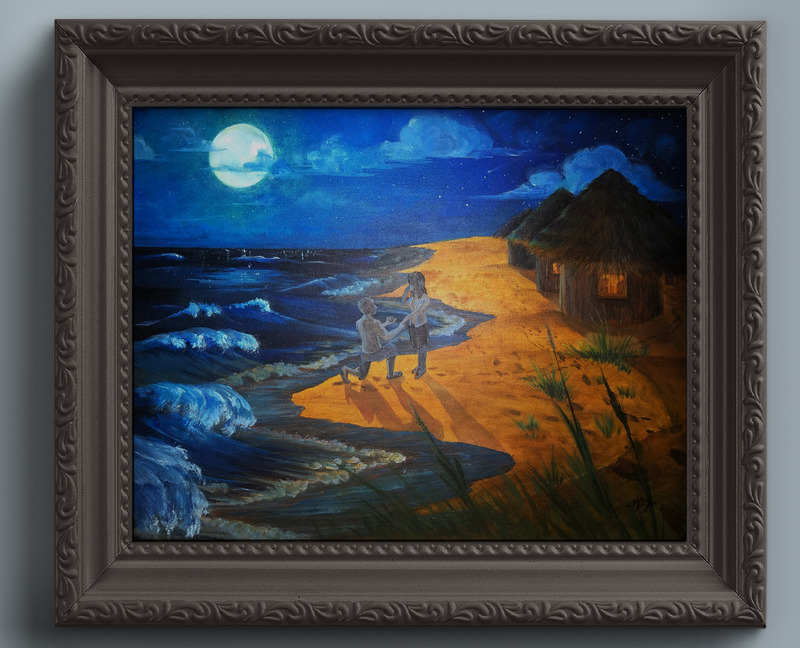 A rendition of a scene from a client’s dream; commissioned as a rush Christmas gift for the gentleman’s wife. My client described a vivid dream-made-reality 23 years ago when he took his then-girlfriend to St. Lucia to propose on a beach. He attempted to match it as closely as possible to what he envisioned that night, but the location has a large mountain in the distance, among other minor details which were beyond his control. an empty beach devoid of palm trees but with a sense that there had been other tourists there earlier (we settled on footprints disturbing the sand), with a row of simple grass huts during a moonlight (full moon) night, what they were wearing, the exact pose, and the point of view. The composition was a bit off, so my client graciously indulged my request to add beach grass to the foreground to emphasize the depth of view. 22 inches tall, 28 inches wide.